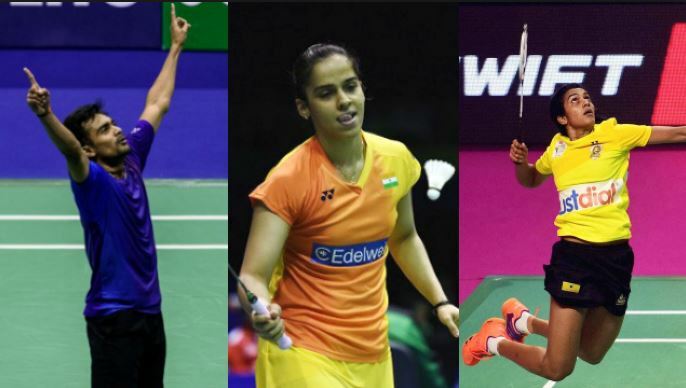 PV Sindhu, Saina Nehwal and Sameer Verma enter quarterfinals while Parupalli Kashyap narrowly misses out to book his spot. PV Sindhu had it easy but Saina Nehwal was tested as the two Olympic medallists entered the women’s singles quarterfinals of the USD 355,000 Singapore Open in Singapore on Thursday. The fourth-seeded Sindhu, a Rio Games silver medallist, took 39 minutes to get the better of world number 22 Mia Blichfeldt 21-13 21-19, her second straight win over the Danish shuttler, who had clinched the Spain Masters earlier this year. World number 6 Sindhu will next face China’s Cai Yanyan, a 2017 BWF World Junior Championships bronze medallist. Sixth seed Saina, however, had to work hard in her bid to avenge a Malaysia Open first-round loss to Pornpawee Chochuwong before pulling off a thrilling 21-16 18-21 21-19 win over the Thai shuttler in the second round. The London Olympic bronze medallist will next square off against second-seeded Japanese Nozomi Okuhara. While Saina was plotting the downfall of Chochuwong, her husband and fellow shuttler Parupalli Kashyap was locked in a fierce battle with reigning Olympic champion, Chen Long of China. Kashyap, a 2014 Commonwealth Games champion, stretched Chen to three games before narrowly losing 9-21 21-15 16-21 to the fourth-seeded Chinese, who had reached the finals at Malaysia Open last year. Sameer Verma, however, continued his impressive run, beating China’s Lu Guangzu 21-15 21-18 to set up a clash with either second-seeded Taipei player Chou Tien Chen or Denmark’s Jan O Jorgensen. Earlier in the day, Sindhu led throughout in the first game after opening up a 3-0 advantage but in the second game, she was locked in a tight battle with Mia till 8-8. The Indian was, in fact, trailing 11-15 at one stage. However, Sindhu managed to claw back at 17-17 and then nosed ahead to seal the issue in her favour. Sindhu had reached the semifinals of the India Open last month.